In this absorbing book Anthony Lott develops a national security analysis that can be used to critique the policies of states. His approach combines realist thought common to traditional security studies and a version of 'political' constructivism common to critical security studies. While the focus on human security remains integral, the 9/11 attacks on New York demonstrate the importance of national security traditionally defined. This book recognizes the importance of both components of security in a broader security dialogue. 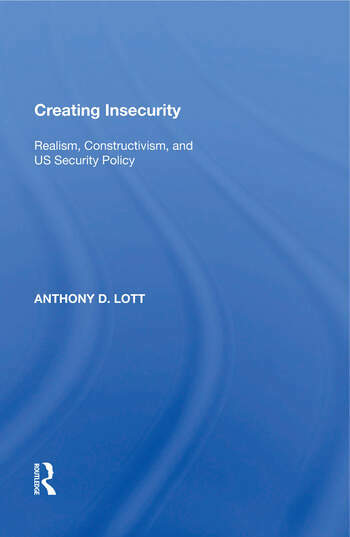 After building a theoretical understanding of security, the work examines four disparate security issues that currently engage policy makers in the United States: the current discourse concerning ballistic missile defense, the war on drugs in Colombia, democratic challenges to economic globalization and the state response, and the US-led war to oust Saddam Hussein from power in Iraq. The book is designed for upper-division international relations courses in national security studies, international politics and theory. Contents: Introduction; Realists on security; Constructivists on security; Understanding the sources of insecurity; Creating insecurity I: unilateral BMD development and US security; Creating insecurity II: US policy toward Colombia; Creating insecurity III: democracy, globalization, and protests from below; Creating insecurity IV: regime change, WMD, and the invasion of Iraq; Conclusion; Bibliography; Index.